Stress seems as much a part of modern life as budget airlines, mobile phones and the Da Vinci Code. But National Downshifting Week highlights how a growing number of city types are jacking it in for a simpler, quieter life. Stress is more than just a state of mind. About half a million people in the UK experience work-related stress at a level they believe is making them ill.
Up to five million classify themselves as "very" or "extremely" stressed and almost 13 million working days were lost to stress, depression and anxiety in 2004/5. All of which helps explain why 1.4 million people in the UK have had enough of their workaholic ways and have opted to sacrifice their well-paid, high-octane lifestyles for a simpler, quieter life. National Downshifting Week celebrates the trend for taking life easier by encouraging people to take small steps towards living a more relaxed lifestyle. Not all downshifters make the full-blown transition from city slicker to country sloth, many simply choose to spend more time at home, with the family. Natalie Hall, 42, is one of those who took a more radical leap. 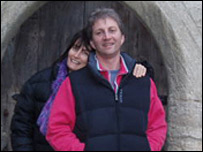 She gave up her job in London 12 years ago and moved to the West Country, where she met her partner Julian Yates. They now have two children. At the time, though, Julian's lifestyle was anything but chilled out. Working with a team of paramedics, on 12-hour shifts - including nights and weekends - he often went over his hours and regularly brought paperwork home. Even Christmas Day was not out of bounds for work. The end of last year proved a crunch time for Julian, after he was told there would be no extra cash for working Christmas or New Years. That was the final straw. He quit his job to become a landscape gardener. Around the same time Natalie set up a hand-made wedding card business. She says that before she began downshifting, she was entangled in a lifestyle of thinking she needed "a bigger house, the newest car, the nicest clothes". "You fall into the trap and don't know you're doing it," she says. "I was influenced by the people I was working and socialising with... and powerful advertising." Julian now works locally, meaning he can even pop home for lunch. He enjoys being his own boss and this year will be at home for Christmas for the first time in many years. "It's nice to know you're working for your own benefit, and I love being outside all day," he says. Natalie admits they now need to be thrifty with their money and that downshifting has been a "learning process requiring team work". To cope with the downturn in income, Julian sold his motorbike and Natalie now rarely buys new clothes for herself, instead wearing "something until it dies". They have become more self sufficient, growing their own vegetables. She buys basic ingredients to cook food and says her children eat well. Do they not miss the take-outs and pub nights? "We've got everything we need," she says. "We're happy floating along enjoying life. It's good for the soul and for your well being." Does she not hanker for her old life near London? Or feel envious of well-off friends? "Once you step away from it, you don't miss it," she says. "If I ever go back to visit, I hate it. They're too wrapped up in keeping up with the Jones'. I pity them. "They're like swans - floating on surface but with legs paddling like mad to maintain the life they've become accustomed to. They're frightened to leave." And does the down-shifting stop here - or is there more to go? Natalie and Julian are hoping to grow more of their own vegetables next year and have grand plans to install solar panels one day. But first, they are planning an ever-so-slightly indulgent day - their wedding. "I'm making the flowers, table decorations and cake," says Natalie. Why is country living always made to seem the choice of the indolent? Country people work at least as hard as city dwellers, but have set our priorities as community and family. Our working hours are not shorter, but we will waste less time commuting or lunch time window-shopping and socialising. We tend to work with others in our community rather than competing with them. Of course there is stress, but a run/walk in fresh air will alleviate that better than slogging on the treadmill of a stuffy gym. My Wife and I are moving out of London next week. We can not stand living in a blighted inner city with it's constant low level violence and destroyed communities. Seven local pubs have closed down in the last 2 years and with them, any sense of community. Local shops will go next.Everything is been sold off for "luxury flats". Soon, the only "community" asset will be the Tescos' carpark ! In 20 years our community will be more divided than ever - between those that had the means to escape and the poor people that remained. Good luck to them. I have only been working for 6 years since leaving university and to think that i've got 40 more years of "this". It's too much to bear. We left the UK four years ago for our French dream. We now have a busy carpentry business and are on the go all the time, but the beautiful countryside all around us and our old home full of imperfections is just great. There are no Joneses to keep up with here and if someone has money you'd never be able to tell and you probably wouldn't care either!! We are happy just being us and living the simple life. Natalie and Julian have a right to live as they wish, and good luck to them; but to say that those who do not make the same choice are "too wrapped up in keeping up with the Jones'. I pity them" is insufferable sanctimonious piffle. Neither choice is superior, live and let live. I'd love to win the lottery to be able to pay my mortgage off. Id then be able to spend more time down my allotment. Although this year I'm raising several turkeys ready for christmas.. I work in London and dream of downshifting to a simple life and living in the country. Once I have finished clearing my credit cards I will be leaving my well paid job and selling up all the trappings of sucess to live a more chilled and happy life. I totally agree with this article, but what do you call someone who was never upwardly mobile to start with? Unfortunately only those with high-octane jobs are the ones who can now afford rural retreats in the country. I couldn't agree with Natalie more. We left London 3 years ago because we were fed up with the rising crime rates, poor schools and general filth in our area. My husband now works from home - to do this, he had to take a salary cut - and I gave up my job to spend time with the children. The lack of money took some time to get used to, but now we budget quite carefully and also grow our own vegetables. We are outside much more than we used to be. Even though we still live in a city (albeit a much smaller one than before), we notice the weather and the seasons much more than we used to. We now have just one car and hardly ever use that. We too are looking at installing solar panels and other alternative energies. I have become a hippy! Aged 35!!! I combine both types of living. I live in a beautiful part of the country twenty five miles away from work, grow my own veg (sufficient for the whole year) and keep a few hens. Meanwhile, I am a tax partner in an accountancy firm but refuse to let this element of my life exceed normal full time hours. It works well. It's alright for those that can afford to 'downsize' because they're leaving behind large salaries, bonuses and the like and probably have a large house or capital stashed away. Some of us have been downsized without being consulted and I can tell you, its not always very nice! Especially when you can't upsize again because you're seen as too old, too out of touch, too costly to re-train, too expensive to employ, etc., etc. Sorry for the sour grapes! I live and work in Oxford. My daily commute is 15 mins max. I see stressed commuters travelling to and from London on the train and ask why? They undoutably earn more than us, have got a bigger house and an expensive car, (shame they're never there to enjoy them), but I for one don't understand it. More fool them I say. Oh pleeeeese this is all so passe! as illustrated by the photograph accompanying the article - Tom and Barbara Good from the '70's UK sit com The Good Life. I personally find "good lifers" are as boring as the go getters they have smugly proport to have left behind!